The highly anticipated dump of social media ads Russian propagandists used to influence the 2016 election against Hillary Clinton was made public Wednesday, revealing at least one ad aimed at titillating gay voters with a buffed up version of her opponent in the Democratic primary. 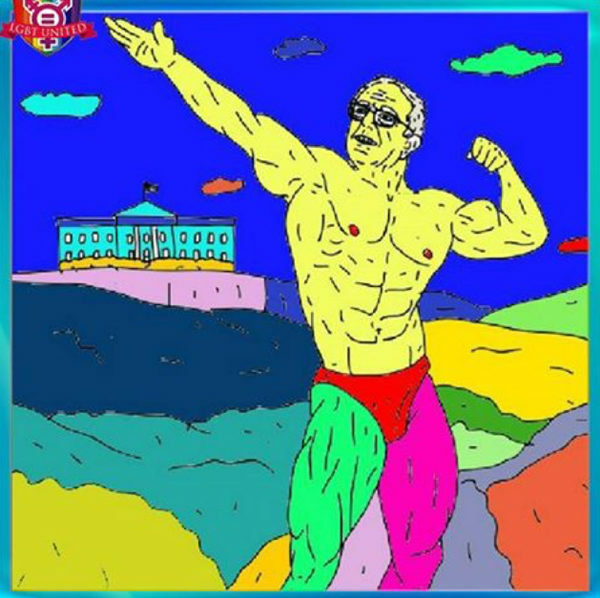 Democrats on the House Intelligence Committee dumped the ad featuring “Buff Bernie” — an image of Sen. Bernie Sanders (I-Vt.) wearing a speedo and with generous muscles — as part of the larger dump of the social media ads through which Russia sought to influence the election in favor of Donald Trump. The book isn’t fictitious. Copies of the book, written and illustrated by Nicole Daddona, are still available online for $15. The ad quotes Daddona as saying she “wanted to stop taking this own thing too serious.” That’s an actual quote from the author from a Buzzfeed article on her coloring book. The ad was distributed on the account of “LGBT United,” one of the many social media accounts through which Russia distributed propaganda and one geared toward influencing LGBT people and LGBT rights supporters. Other accounts, such as “Being Patriotic,” “Woke Blacks,” “Blacktivist,” “South United,” and “Army of Jesus,” were aimed at other groups of American voters. According to metadata the House Intelligence Committee also made public, the ad of Sanders in the buff wasn’t terribly successful. It received a total of 848 impressions and 54 clicks. Others ads were likely more successful. According to the Daily Beast, more than 70 millions people may have ads linked to Russian propaganda accounts during the 2016 election. Although intelligence officials have said Russia’s intent was to influence the election in favor of Trump, the ad seems more geared toward a Sanders victory in the Democratic primary. The metadata shows it was purchased and distributed in March at the height of the primary season, not the general election. Yet another ad from the “Heart of Texas” social media account seems to target social conservatives by inflaming fears over LGBT rights. The ad features a split image of a Pride flag combined with a picture of an Islamic terrorist in the shape of the United States superimposed over the Texas state flag. The House Intelligence Committee unveiled the material on the same day tech leaders from Facebook, Google and Twitter testified before Congress as part of the committee’s investigation into Russian influence on the 2016 election. Rep. Adam Schiff (D-Calif.), top Democrat on the committee, said during the hearing the ads the committee made public Wednesday are a representative sample of Russian propaganda seeking to undermine Clinton’s bid for the White House. Not more fake news about how Russia tried to swing the election. How about an article on Donna Brazile’s new book about how the Democratic primaries were rigged in 2016. The Democrats are still blaming everyone else for Hillary’s loss, when the reason was Hillary herself. Most people just don’t like evil women.